Seats are filling up for the $1 million buy-in event. Antonio captures the first ever Big One for One Drop title in 2012. If you want to plunk down $1 milly for a seat at the 2014 Big One for One Drop this summer at the World Series of Poker you’d better act fast. The capped seating is going fast with only 33 seats left as 23 seats are spoken for. 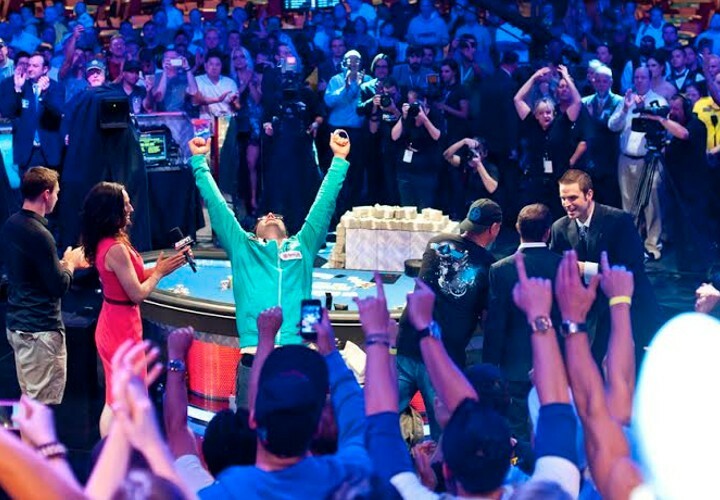 Some of the biggest names in poker will be joined by some of the most anonymous names in business to battle over what is likely to be the richest prize poker has ever seen (potentially $20 million first place prize). One Drop defending champ Antonio Esfandiari, 2012 One Drop runner-up Sam Trickett, the People’s Champ Phil Ivey and Team PokerStars pro Jason Mercier headline the list of 17 known players who have already committed to the high-stakes, high-pressure tournament. Check out the full list of the already committed right after the jump! Here’s a list of all the seats spoken for – no take backs. Copies/pasted from the WSOP website – the full press release you can read right here. All 17 of the committed named players played in the 2012 event. The WSOP has stated that they will strictly enforce the new 56-seat cap so start selling pieces of yourself right away!